After January’s raids that tore teens from their families and plucked them off buses on their way to school, the Department of Homeland Security (DHS) is about to embark on a renewed quest to arrest and deport Central Americans who applied for refugee status in the United States in the summer of 2014. According to sources reported by Reuters on 12 May 2016 and confirmed by DHS a day later, the agency is sending Immigration and Customs Enforcement (ICE) agents out on a second wave of raids against immigrants, this time with the specific aim of apprehending and imprisoning Central American women and their children, or “family units”, and unaccompanied minors. A recent article by Julia Edwards published by Reuters referred to internal papers that were revealed to the news agency concerning the upcoming operation. Despite assurances by DHS Secretary Jeh Johnson that “we will offer vulnerable populations in Central America an alternate and legal path to safety in the United States,” the impending actions seem to be anything but. While January’s arrests were carried out in only three states (Georgia, North Carolina and Texas), the new raids will take place throughout the country. Though DHS avows it is only targeting dangerous individuals who have already been deemed deportable by a court of law, byzantine courts, nebulous immigration laws, lack of access to counsel, and pressure from bed quotas and private prison corporations such as GEO and CCA are placing mostly innocent and deserving people, including children, in ICE’s crosshairs. According to the government’s own findings, as reported by the United States Citizenship and Immigration Service (USCIS), the agency determined that in 2015, the vast majority of asylum petitions, 88%, were found to be based on credible and reasonable fear, even including statistical juggling such as giving equal weight to a single closed case from Ethiopia. The percentage reached 100% for most countries in the second quarter of the year. Community activists AlertaMigratoriaNC (NC Migrant Alert) have been working hard to spread the word about six teens who were arrested in January raids in North Carolina. 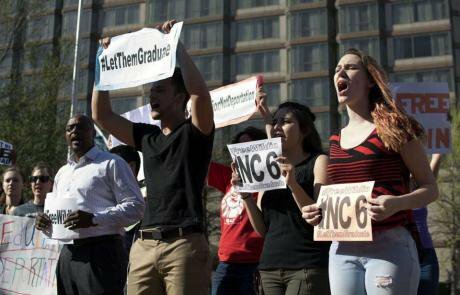 Of the #NC6, three have already been deported, while Yefri, Pedro and Wildin languish in detention. In an unprecedented move, AlertaMigratoriaNC has published a flyer in response to the announcement about the new raids, delineating what to do if you are in a targeted group. 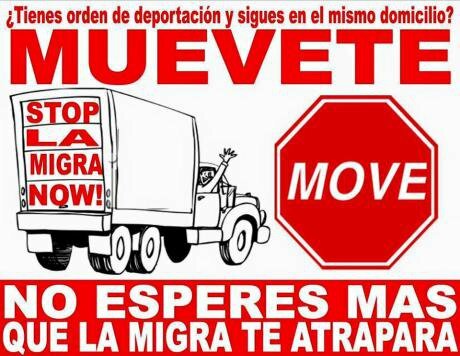 Their message: MOVE! Even though he was in the company of his father who has immigration status, Pedro Salmerón was picked up by ICE on January 26 as the two were on their way to the father’s job site. Pedro was a 10th grader but since he had already turned 18, his family thought it best to avoid school after learning about the raids. Speaking to reporters for The Charlotte Observer, family members recounted how a cousin had been castrated and decapitated in El Salvador, prompting Pedro’s departure to join his mother and father in the U.S. El Salvador has the world’s highest homicide rate, and the Peace Corps cited this fact when it decided to pull out from the country this year. Its violence is gang-related and young boys and girls like Pedro are its most likely victims. Women and small children without deportation orders are also being treated like criminals and arrested in aggressive and inhumane fashion. A report by the Southern Poverty Law Center (SPLC) and the Georgia Latino Alliance for Human Rights centers on women and children in the Atlanta area who had not been determined to be deportable, who were in fact being processed by the courts, who had followed all the steps and attended all the appointments and were known to DHS to the extent that they were all wearing ankle monitors. With the North Carolina teens being held in Georgia, and the Atlanta arrestees sent to Texas, assistance from family, friends and lawyers is difficult. Instead of following their professed dictate to deport serious criminals, the Obama administration, through DHS and ICE, has decided to focus their efforts on the most vulnerable, putting women and children indeed first.